Colors: Tricolor black/tan/white or black/rust/white,. The Bernese Mountain Dog is a sturdy, heavy dog, with a beautiful weather-resistant tri-color double coat of black with symmetrical markings of rust and white. The dog should have a white blaze on the chest, white on the head and toes, and rust markings over each eye, on the cheeks, sides of the chest, under the tail and on each leg. The coat is moderately long and either straight or slightly wavy. The broad head has a slight furrow down the middle. The medium-sized triangular ears are pendant. The dark eyes have a gentle expression and the nose is black. The teeth should meet in a scissors bite. The body is compact with a wide, deep chest. The brisket should reach down to the elbow at least. The tail is long and bushy, carried low when in repose a slight upward curve is permissible when the dog is alert,. Dewclaws should be removed. 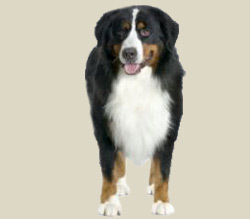 The Bernese mountain dog is an easygoing, calm family companion that is, after it leaves its adolescent stage,. It is sensitive, loyal and extremely devoted. It is gentle with children and often reserved with strangers. It generally gets along well with other dogs and pets. This dog enjoys the outdoors, especially in cold weather. It needs daily but moderate exercise, either a good hike or a walk on leash. It enjoys pulling. Although it can physically live outdoors in temperate to cold climates, it is so in tune with its human family that it cannot be relegated to life alone in the yard. Inside, it needs plenty of room to stretch out. Its coat needs brushing one or two times weekly, much more often when shedding. The Bernese life span is described by a Swiss expression: "Three years a young dog, three years a good dog and three years an old dog. All else is a gift from God." Note: Extra care must be taken to avoid heatstroke.